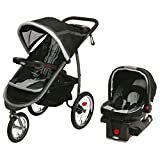 What are the best Jogging Strollers with Car Seat? Parents who would like to keep fit while taking care of their baby can hit two birds with one stone through the popular jogging strollers. These strollers allow parents to jog or run on any type of road surface because the wheels are designed to absorb shock. Your baby can nap in peace or be entertained by everything around him/her while you do your daily exercise. More often than not, parents who jog want to take their daily exercise somewhere other than their neighborhood. A park or a running/jogging area is much safer as there are less cars passing by. This is why most parents have to drive to their ideal jogging location, prompting the need for a car seat. If this is the case, what you need is a jogging stroller travel system. A travel system is composed of the main stroller (either jogging or umbrella stroller or both) and a car seat. You can buy these together to save you money or buy them separately if you are eyeing different brands. Here in this article, we will be showing you jogging strollers with car seat combo. What are some of the best jogging stroller travel systems? This travel system comes with a jogging stroller and infant car seat. 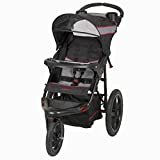 This stroller is very suitable for jogging/running because the wheels are designed in such a way that the baby won’t be affected by the bumps on the road or the speed. There are two large hind wheels and one single front wheel that can be locked so that it only follows a straight line. The wheels feature all-terrain tires. The seat is padded and comfortable, so your child can nap while you run. There is a safety harness to hold your child in place. There are molded trays and two cup holders for both parent and child. A footrest is also installed so your child’s feet won’t be dangling all over. There’s a basket underneath the seat that is roomy enough for both your and your child’s essentials. The accompanying car seat can be installed in the backseat in place. It can also be adjusted according to the desire height. The Graco jogging travel system is one of the bestsellers in this category. Although a bit more expensive compared to the baby trend travel system, this one is great because it is known to be very reliable and it has already gained a steady following. The stroller features three air-filled rubber tires with suspension for a smooth ride on any terrain. There are two hind wheels and one front wheel. The lone wheel in front can be locked so that it won’t wobble in case you roll it on an uneven surface. The seats are padded with luxurious foam and lined with thick cloth. The seat can be reclined in multi-positions so your child can nap whenever needed. The storage basket underneath the seat is also very roomy to house all your baby essentials. A parent tray also contains a convenient smartphone holder so you can listen to music while running. There’s also a large canopy covering the seat to protect your baby against harmful UV rays. The accompanying car seat is easily installed and can hold babies from 4 – 35 pounds. This jogging stroller with car seat is perfect for all-terrain running because of its air-filled bicycle tires. The front wheels are lockable to avoid swiveling that may cause crashes. For the comfort of the parent, there are molded trays with cup holders for the child and the parent. There is also a roomy mesh basket underneath to hold essentials. The jogging stroller has a canopy to protect the child from UV rays. The seat can also be reclined in multiple positions to cater to the baby’s different sleeping positions. The seat is padded with a fully adjustable five-point safety harness and tether strap. The front of the seat has reflectors to provide low-light visibility. The car seat that comes with the jogging stroller is padded and has safety belts to keep the baby in place during long drives. It can be installed onto the back seat effortlessly. This jogging stroller with car seat is designed to give the parent/runner with ease while keeping the child safe and snug. It has three wheels (one front, two back) that are made of rubber and air-filled. It comes with suspension to absorb the shock caused by uneven terrain. The front wheels are lockable for a safer ride for both parent and child. The deluxe seat is padded and multi-position reclining. It has safety straps to keep the child in place. There is a huge basket underneath the seat, which is roomy enough to hold your needs. The stroller is also travel friendly as it folds easily with just one hand in one second. The accompanying car seat is made with strong yet lightweight materials to hold the baby in place while you’re driving. The SnugRide car seat connects to the base in just one click. Jogging strollers with car seats are very effective for parents who are always on the go. It enables them to transport the child from one place to another without the hassle. Since most parents/runners opt to run in safe parks rather than in their own neighborhoods, they are required to drive to their chosen running spot, which makes the car seat and jogging stroller combo handy.